Monotype’s Ying Hei™ is a new Chinese sans serif typeface family designed and built for performance and elegance on screen and in print. It is available in five weights covering text and display sizes, with versions for Simplified and Traditional Chinese. M Ying Hei was designed to the highest standards by the Monotype Hong Kong team, led by Kenneth Kwok and Robin Hui. It features ample inter-character spacing, open shapes, varying proportions and unambiguous forms to ensure consistent and optimal legibility in a range of challenging usage environments. M Ying Hei conveys a professional, rational and efficient image for any document. With a minimal and contemporary design, M Ying Hei is free from extraneous details, with a well-considered skeleton and refined stoke designs. This allows it to help readers to quickly recognise a message, and improve reading efficiency. For the Latin characters, M Ying Hei features the famous Neue Helvetica® typeface integrated in a refined and thoughtful manner. M Ying Hei’s flexible design can also be used with a variety of other popular Latin san serif typefaces including Avenir® Next, Neue Frutiger®, and Univers® Next typefaces among others. This entry was posted in Chinese Fonts and tagged alt.TYPE, Chinatype, Chinese Fonts, 黑体, Heiti, Linotype, Monotype, Ying Hei on May 25, 2016 by alt.TYPE. M Elle is available in three styles – Light, Medium and XBold. To test sample text, click here. 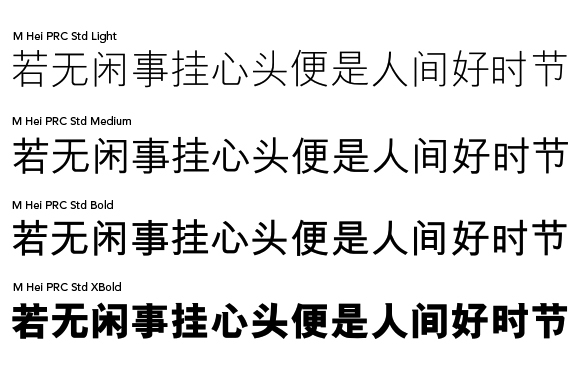 If you would like some recommendation for pairing of Chinese & Latin typefaces, we will be happy to help too. This entry was posted in Chinese Fonts and tagged alt.TYPE, alttype, Chinatype, M Ellan, M Elle, M Razor, Monotype, Stylized Chinese fonts on August 16, 2013 by alt.TYPE.